">the Bold. Photos suggested that it would be the sexiest thing to come out of Canada since Sarah McLachlan's Fumbling Towards Ecstasy. And they wuz right. Boy Genius says it'll be available this summer on AT&T 3G, with a T-Mobile 3G edition in the wings—the handset can handle 850/1900/2100Mhz for HSDPA/UMTS, plus T-Mo's 1700MHz band. Sascha at PC Mag is reporting a CDMA/EV-DO version as well. Jump for more details like that 480 x 320 screen—and giddy tittering—from sources all around the web, plus the official press release. • 480 x 320 resolution screen with 65,000 colors—Crave says "never seen a better-looking display"
• Keyboard has 8800-style "sculpted keys," says PC Mag, "but the rows are separated by curved barriers"
• Pricing will be $300 to $500 says BGR, a pretty wide (and obvious) range; Crave narrows it to "$300 to $400"
Waterloo, ON- For customers seeking a smartphone that makes a bold statement, Research In Motion (RIM) (Nasdaq: RIMM; TSX: RIM) today introduced the admirable BlackBerry® Bold™ smartphone. Crafted from premium materials, inside and out, that radiate elegance with a dramatic presence, the BlackBerry Bold is designed to give business professionals and power users unprecedented functionality and performance in an intuitive BlackBerry® smartphone. It is the first BlackBerry smartphone to support tri-band HSDPA high-speed networks around the world and comes with integrated GPS and Wi-Fi®, as well as a rich set of multimedia capabilities. From its lustrous black exterior, satin chrome finished frame and stylish leather-like backplate, to its stunning display, sophisticated user interface and newly designed full-QWERTY* keyboard, the BlackBerry Bold smartphone is a symbol of accomplishment and aspiration. The BlackBerry Bold smartphone's support for tri-band HSDPA and enterprise-grade Wi-Fi (802.11 a/b/g) networks and its next-generation 624 MHz mobile processor make short work of downloading email attachments, streaming video or rendering web pages. 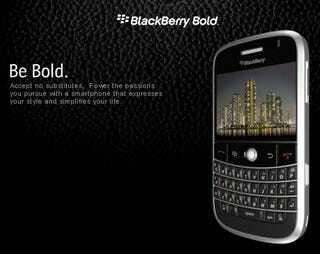 The BlackBerry Bold also includes 128 MB Flash memory plus 1 GB on-board storage memory, as well as and a microSD/SDHC memory card slot** that is conveniently accessible from a side door. It comes with the renowned BlackBerry productivity applications, including phone, email, messaging, organizer and browser, and works with thousands of mobile business and lifestyle applications, making it easier than ever to stay connected, productive and entertained. With this powerful new smartphone, users can even talk on the phone while sending and receiving email or accessing the web, and download Word, Excel or PowerPoint files and edit them directly on the handset using the preloaded DataViz® Documents to Go® suite. The BlackBerry Bold smartphone features a new acoustic design that increases the size of the phone's audio sweet spot, improving listening quality and clarity. It also comes with numerous premium phone features including Speaker Independent Voice Recognition (SIVR) for Voice Activated Dialing (VAD), Bluetooth® 2.0, with support for hands-free headsets, stereo headsets, car kits (including car kits that adhere to the Bluetooth Remote SIM Access Profile) and other Bluetooth peripherals. It is a quad-band EDGE and tri-band HSDPA handset that supports global roaming**** and features dedicated 'send', 'end', and 'mute' keys, smart dialing, speed dialing, conference calling and call forwarding. It also features noise cancellation technology that offsets background noise, a powerful speaker phone and support for polyphonic, mp3 and MIDI ring tones.